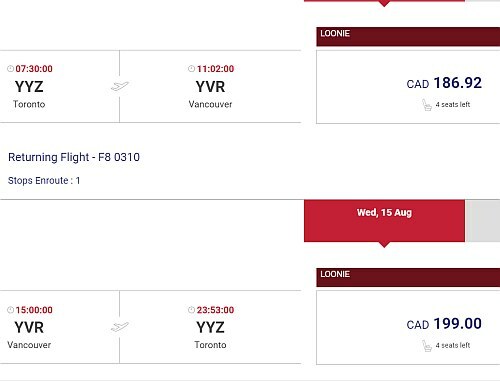 Flair Air (formerly New Leaf) is showing flights from Toronto to Edmonton and Vancouver for travel in the summer of 2018 for $366 to $386 CAD roundtrip including taxes. The flights between Toronto and Edmonton are non-stop, but the Toronto-Vancouver flights have 1 stop. Vice-versa trips (eg: Edmonton/Vancouver to Toronto) are also available for $366 to $386 CAD roundtrip. For comparison, Air Canada, WestJet, and Air Transat are currently charging $592 to $694 for the same summer flights. Vice-versa trips are also available for a similar price, for anyone that wants to come visit you in Toronto or Hamilton. toronto, yyz, flight deals, vancouver, british columbia, canada, yvr, bc, north america, alberta, winnipeg, manitoba, ywg, abbotsford, yxx, new leaf, edmonton, yeg and flair air. 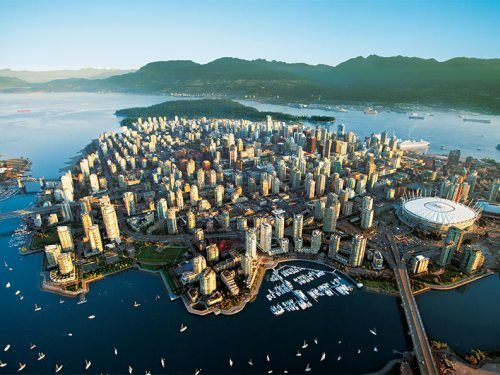 2 Responses to "Toronto to Edmonton or Vancouver (or vice-versa) - $366 to $386 CAD roundtrip including taxes | peak summer 2018 travel"
Non-secure website. I guess I'll call in? You might have to anyways - I'm seeing a lot of reports of people having issues with the Flair Air website not working. They just launched the new website yesterday, it sounds like it's having problems, especially with payment processing. On the Flair Air facebook page I saw that they were waiving the usual $16 call-center booking fee.